At the first Waldorf School in Stuttgart, Rudolf Steiner encouraged the original core of teachers to work into the future together by carrying the school forward in a new way. He asked that they take on the rigor of establishing a new social form. He acknowledged that this task would be difficult, but he said that it was absolutely necessary for ongoing social development, that preparation begin for humanity to experience a new way of working with one another. This form, often called the College of Teachers, was to be based on a spiritual beholding of one another, a working out of consensus, and a conscious attempt by the teachers to align themselves with the “being” of the school through disciplined meditative practice. The College of Teachers consciously assumes responsibility for the spiritual and pedagogical life of the School. Through active research and extensive study in weekly gatherings, the group seeks to uphold and apply the principles of Steiner education throughout the Dandenong Ranges Steiner School. The College of Teachers is the educational decision maker and guide of the school’s life. Decisions in the College of Teachers are reached on a consensus basis. This sometimes requires more time, but the values of equality and mutual responsibility are a true priority and this form of social working is a role model for students. Teachers attend weekly meetings and are involved in policy issues, debates and decisions as to teaching and learning practices and strategies, assessment, as well as all matters relating to the life of the school. This results in the College’s members carrying the responsibility of decisions that direct the path of the school and are actively engaged in developing the ethos of the whole. The College comprises all permanent teachers who have completed their provisional period at the school , who have indicated their willingness to take on the College’s responsibilities and have been accepted by the College. The Educational Administrator is also a member of College. The College Nominates one (or more, if a shared role is agreed upon) to be the College Chair. The College also nominates two College members and two College nominated individuals to the Committee of Management. The College nominated positions may be teachers, parents or other staff. 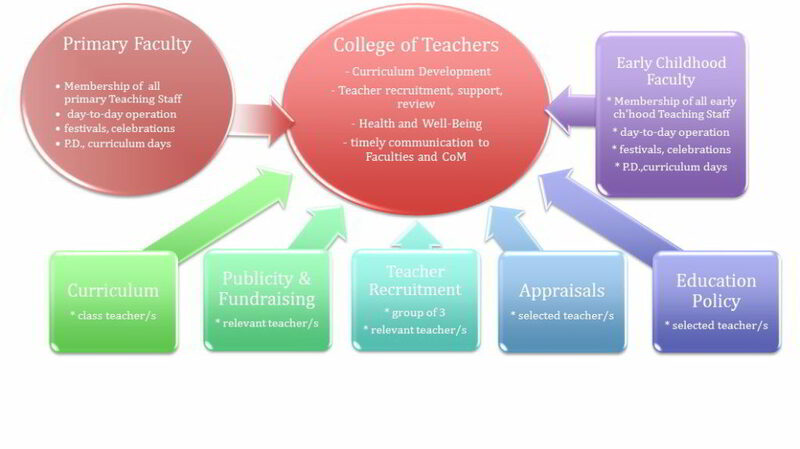 The College of Teachers is responsible for overseeing all teaching staff. From interviewing and recommendation of their employment to the Committee of Management, to appraisals and professional development. The business decisions of the school are governed by the Committee of Management. The Committee of Management is comprised of two representatives elected from the membership of the Association, two representatives of the College of Teachers and up to two others appointed by the College of Teachers. The Committee is responsible for decisions regarding administration and co-ordination of the organization, and management of community activity groups. Membership is open to all parents, staff and other supporters of the Dandenong Ranges Steiner School. To be elected to the Committee of Management, nominees must be current financial members of the Association of the Dandenong Ranges Steiner School Incorporated. Meetings are held fortnightly and are open to all interested families. The Chairperson must be notified of intention to attend.